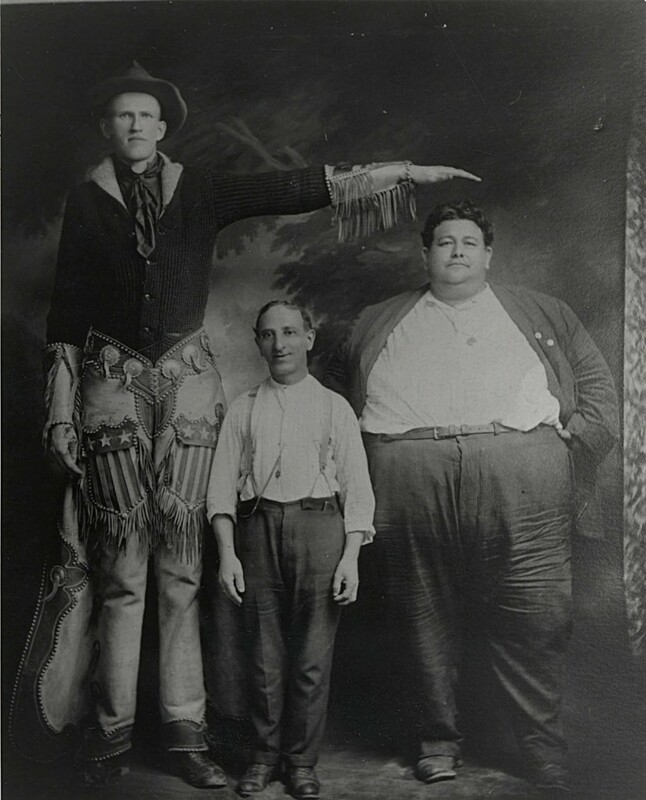 Tempean Teodulo Valenzuela, the “World’s Fattest Man” appears at right with fellow sideshow attractions during his early circus days in California. Tempe can take justifiable pride in the fact that it is a city of many superlatives ─ the only place in America, maybe the world, with an inverted pyramid for a city hall; home to the world’s first inland ocean (Big Surf); Town Lake is Arizona’s most popular private tourist attraction; the first Arizona city to host a Super Bowl; and a Pope; and was home to the world’s fattest man! Amidst tabloid celebrity names like Colossus of the Rhine, Two Ton Tessie, The Blimp, The Beautiful Fat Lady, America’s Fat Girl, The Giant Monster Schoolgirl, and the Pulchritude Queen of the Avoirdupois was Tempe’s own Tom Ton, The World’s Fattest Man. Up until the health-consciousness movement of the 20th century corpulence was considered healthful and even an indicator of affluence. Think King Henry VIII. That said however, severely obese people have always been the subjects of curiosity. With the emergence in the 19th century of large-scale circus and carnival side-shows a perfect venue was created for the exhibition of this and other human anomalies. There was a great likelihood when he was born March 26, 1896 in Florence, Arizona that Teodulo A. Valenzuela would grow into a heavyweight. Although his father weighed an unremarkable 165 pounds his mother Dolores tipped the scales at 360 pounds. Two older brothers each weighed more than 300 pounds. And a sister reached 510 pounds near the end of her life. Some time before 1905 the family moved to Tempe where Teo tried to fit in as best as possible. As young boy Teo shined shoes at Wyatt’s Barber Shop. It is said that the Valley’s oppressive summer heat in a time before the air-conditioning made working in the shop too difficult forcing him to move on to a variety of other jobs, including selling ice cream and candy in his family’s business. Later Valenzuela became manager of a pool hall at the foot of Tempe Butte at 4th Street and Dewey in the Mexican enclave of San Pablo. It was during that period Teo surpassed 600 pounds. But that didn’t stop him from dating Liondies Estrada the girl of his dreams whom he married not long after. His brother-in-law Raphael Estrada was a local celebrity as a Tempe Normal School basketball standout. By 1920 when he was 24, Valenzuela had become the proud father of two children. Needless to say a 600 pound man was certainly an unusual site in a small town like Tempe. But the good natured Valenzuela took comments and stares in stride. He was used to being the center of attention wherever he traveled ─ sometimes to the point of annoyance. Later in 1920 while on a vacation to Long Beach, California Valenzuela was so hounded by gawkers that he was forced to seek police protection. Teodulo Valenzuela was arguably Tempe’s most reluctant celebrity. “The World’s Fattest Man” is not the title most would seek. But that was the fate of a kind, gentle man who grew up in Tempe. Living a normal life in a world scaled for those much smaller is a daily struggle for extraordinarily large people. Earning a living to support a family is another major challenge. After working traditional jobs like sales, store and pool hall manager, Valenzuela who continued gaining weight throughout his life was forced into a career not of his choosing. A curiosity wherever he went, Teo was besieged by requests to become a circus and sideshow attraction. When conventional employment became impossible, Teo finally relented making his first sideshow appearance in 1920 at Mesa’s Arizona Cotton Festival and later that year at the Arizona State Fair. By 1921 at age 25 Teo came to accept his future lie as a sideshow freak under the continual stare of gawkers. Valenzuela found a manager who soon got him work at the Pike, an ocean-front amusement strip in Long Beach. Within two years Teo was traveling with the Snapp Brothers Shows ─ a small town touring circus and sideshow. With his weight approaching 800 pounds touring became too much for Teo. With his wife and three kids back home in Los Angeles, Tom Ton was forced to take up residency as a sideshow attraction at Coney Island. But living normally was becoming increasingly difficult. Teo could no longer find chairs to support him. His considerable bulk required Teo to stand while feeding himself. Rising from a bed that could barely support his weight required all of his strength and energy. Long past being able to ride in automobiles Teo was consigned to travel in large trucks. Only freight elevators could lift his massive weight. Teo gained an unbelievable 100 pounds during a two-week period. With his heart failing and breathing becoming more labored Teo knew the end was near. Long separated from his family, Tom Ton wanted to be with them one last time. He journeyed back to Los Angeles in the indignity of a baggage car. Upon arrival a two-ton truck transported the dying Valenzuela to a hospital which required two extra-buttressed beds to support his massive frame. On May 27, 1926 Tom Ton passed away peacefully two days before his 41st birthday. During a three-day viewing period over 40000 paid their last respects to the man who wanted nothing more than to live an ordinary life out of the spotlight and never be called “Fatty” again. Valenzuela is buried in the star-studded Calvary Cemetery where 12 pallbearers and a bloc-and-tackle lowered his 3600 pound casket to its final resting place. 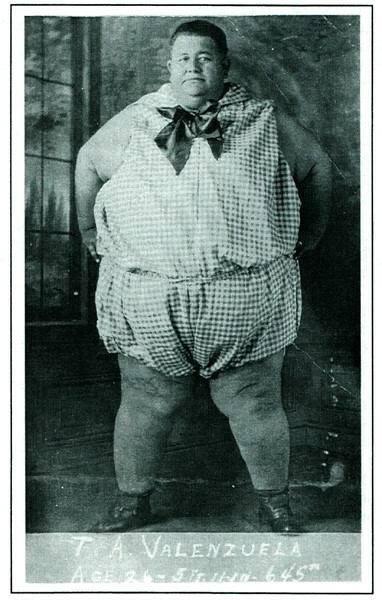 Tempe’s hometown celebrity Teo Valenzuela, the World’s Fattest Man tipped the scales at 645 pound in this 1922 photograph. Courtesy of Maude Olsen / Tempe History Museum.